Definition: Doing what you are told, right away, and with a happy heart without being reminded. 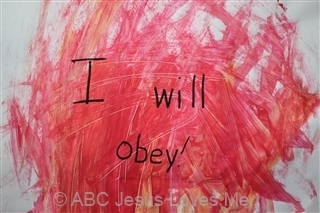 Objective: I am to obey God, no matter what. When were the people supposed to bow down to the golden statue? What would happen if Shadrach, Meshach, and Abednego did not obey? Who did Shadrach, Meshach, and Abednego choose to obey? How did God protect the three men in the fiery furnace? Because of Shadrach, Meshach, and Abednego's obedience, what did the King realize? Verse: James 1:22 (NLT) - But don’t just listen to God’s word. You must do what it says. To God's Word, to God's Word. Information: First name written on tracing paper. - Play "Simon Says" to coincide with the obedience theme. - Paint the bottom of the child's foot. On a large piece of paper have the child create foot prints. Add the title, "Beautiful Feet." 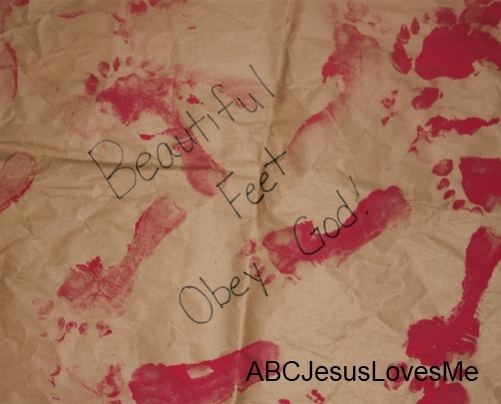 Discuss how our feet are beautiful when they are obeying. Create a scenario and ask the child to choose whether it is best to stop, wait, or go. Have the child "tell" you with hand motions rather than her voice. Focus on activities that involve obedience and respect. 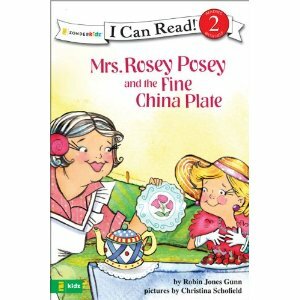 - Read Mrs. Rosey Posey and the Fine China Plate by Robin Jones Gunn to learn how parents set rules to help you stay away from sin. 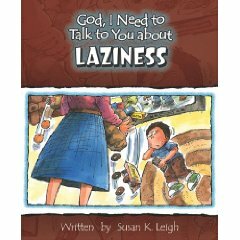 - Read God, I Need to Talk to You About Laziness by Susan K. Leigh. 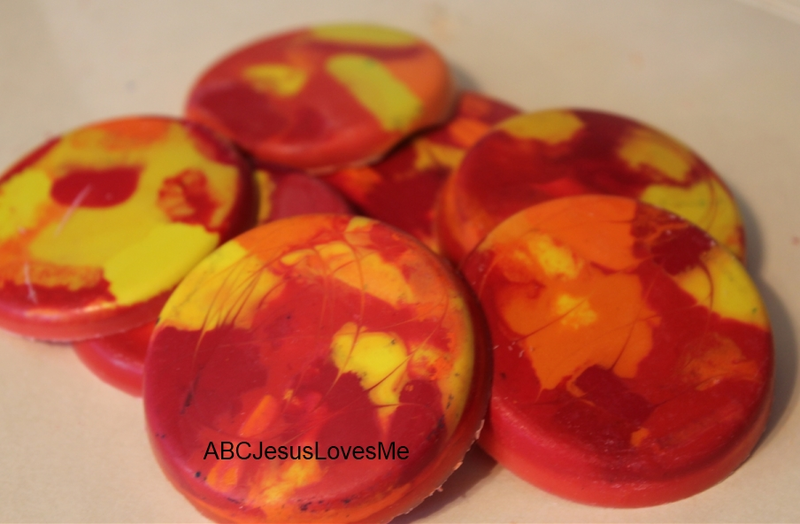 - Color The Fiery Furnace worksheet with your new Fiery Crayons (see below). - Paint "fire" on a piece of paper using red, orange, and yellow paint. Add the title "I Will Obey." - Play Mother May I? to practice obedience. Choose one player to be the "mother/father." Line the rest of the players arm-length apart on the opposite side of the room. The children will take turns asking "Mother/Father, may I ____?". For example, "Mother/Father, may I take five steps forward?" The mother/father either replies "Yes, you may" or "No, you may not do that, but you may _____ instead" and inserts his/her own suggestion. The players usually move closer to the mother/father but are sometimes led further away. Even if the mother/father makes an unfavorable suggestion, the child must still perform it. The first player to reach the location of the mother/father wins the game. Following the game, discuss how it is hard to do something we don't want to do. But by obeying and doing it right away we show our parents and God that we love them. • Comprehension Questions, Memory Verse, Song, Books of the Bible: Because the suggested activities rarely change in these four objectives, they will only be listed in the "Objectives" and not in the "Suggested Activities" portion of the Lesson Plan unless additional information is needed. Continue as suggested. - If needed, ABCJLM contains Shape ideas and worksheets to review the shapes your child needs to focus on. Week 2 focuses on "straight-line letters" E, F, L. Start by creating the characters using short and long craft sticks and move to writing the characters on the Straight Line Characters worksheet. 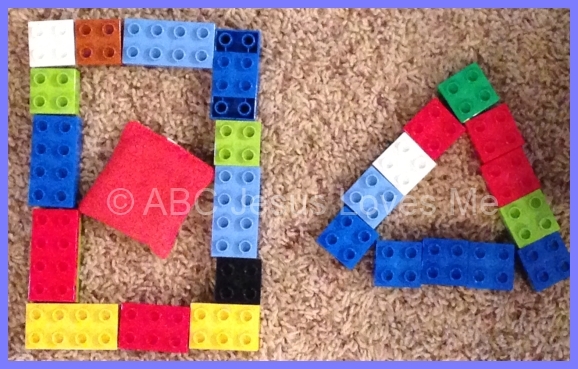 Be sure to say the Letter Formation Chant as the child creates each letter. If the child is ready, for the next two weeks place the letters of her name on the 1” Tracing Paper. Using the 4 Year Curriculum Handwriting Worksheets as examples, draw a box for each letter in the child’s name and add the green and red dots if needed. If required, work slowly adding a letter each day. - Use this book to discuss the various concepts of a book. Problem - The cows and hens refuse to give milk and eggs until the farmer gives them electric blankets. Solution - Everyone gets what they want but then the duck starts making demands. - Ask the child to state how he would have handled the problem. Have the child draw a picture showing his solution. - Write a request letter to someone using a typewriter or computer. This could be to an elected official or company. Draw What I Draw - With sidewalk chalk, have your child copy what you draw and then reverse roles. Remember to start with simple lines and progress to simple shapes. Practice kicking a ball. Start with a large ball and progress to a smaller one. Set up a goal and take turns being goalie. Block Activity is an idea to help the child process and give meaning to what he sees. Use blocks sets such as Parquetry Block Super Set, Pattern Blocks and Boards, Pattern Blocks to do these activities. Four separate ideas are provided on the Block Activity page.